Unlike iPhone, iPod touch does not sport a built-in microphone. Thanks to a recent software update, the second generation iPod touch (with volume buttons on the left side) can now use add-on microphones like TuneTalk from Belkin and iTalk Pro from Griffin. These microphones attach to iPod's dock connector. iPod touch also supports microphones that use the headphone port like Apple's Earphones with Mic or Incipio's new $18 Lloyd microphone for iPod 4G (which does indeed work with iPod touch, it just doesn't fit nicely). The length of your recordings are only limited by two things: Your disk space and your recording quality. An hour-long recording will take up 75MB if you're set to Good recording quality, 150MB when set to Better quality, and 300MB when set to Best quality. Or, to look at it another way, a gigabyte will store 800 minutes if you have your recording quality set to Good, 400 minutes when set to Better, and 200 minutes when set to Best. Even if iTalk Recorder is set on the best quality, you should have plenty of space on an 8GB iPod touch. Now, what happens when you want to copy the recordings to your computer? First, you should know that iPod touch only syncs some of Apple's built-in app to iTunes. Additional apps you install have to figure out how to get their information and files from the iPod to your desktop without syncing with iTunes. You might recall that for Comic Touch, you can email your comics to yourself or you can send the comic to the Photos app. Since Photos is an original Apple app, it does sync with the desktop. As for iTalk Recorder, to transfer recordings, you must download and install iTalk Sync, free software for Windows and Macintosh. Despite its name, you do not actually sync to use iTalk Sync. Instead, the iPod touch and computer need to be on the same Wi-Fi network. 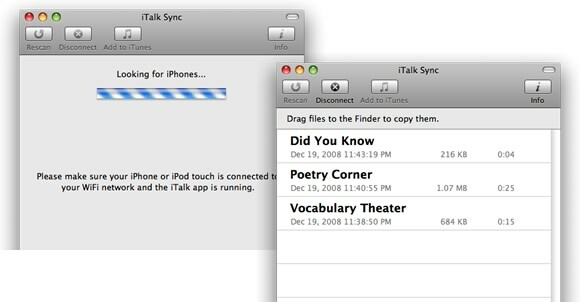 iTalk Sync must be running on the desktop and iTalk Recorder must be launched on the iPod touch. iTalk Sync will display a list of iPod touches and iPhones on the network that have iTalk Recorder running. Choose a device and once Yes is tapped on the iPod touch, iTalk Sync will display all of the iPod's recordings. You can drag and drop the recordings or click the iTunes button to copy them to your iTunes Music Library. If any notes have been input with the recording, they are copied to the desktop as a text file. The audio file itself is in AIFF format. Most audio editing software can import AIFF. AIFF audio files are quite large compared to MP3, so you'll want to use iTunes or Audacity to export the audio as MP3. But first, you can certainly edit the audio with software like GarageBand or Audacity. iTalk Recorder works really well and is free. 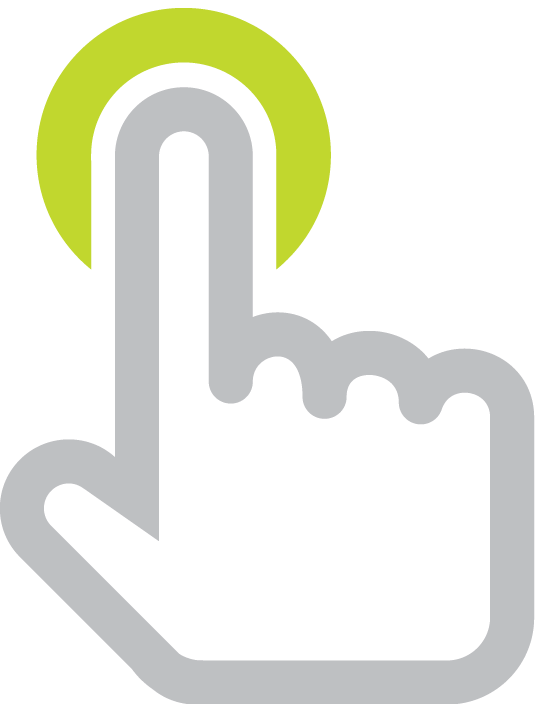 But, the free app will display small banner ads along the bottom of the screen. If you want to remove the ads, you can pay $4.99 for iTalk Recorder Premium. The only different between the free app and the $4.99 app is that the premium app does not display advertisements. There are so many ways to use a mobile voice recorder in the classroom. Apple has some interesting lesson plans listed on their iPod in the Classroom page. A use I have for a voice recorder is for making podcasts. Have a listen to the first half of Learning in Hand: iPods #14: Voice Recording for voice recording examples and ideas. 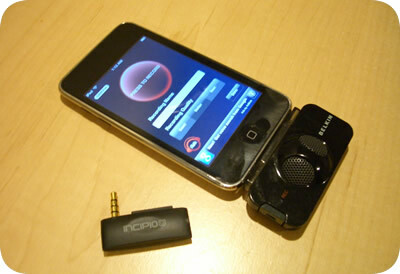 There are other apps besides voice recorders that you can use with an attachable iPod touch microphone. For example, check out the interesting Agile Lie Detector, a Heart Monitor that really works, a virtual recorder instrument, and a musical note tuner. 12 Days of iPod touch continues tomorrow when I share some games that are fit for a classroom.